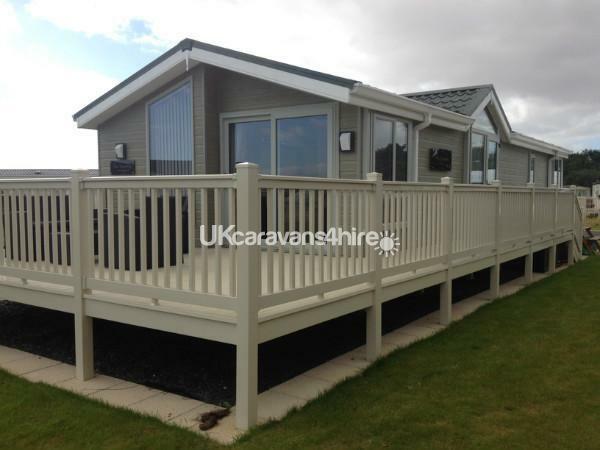 Welcome to our two bedroom Willerby New Hampshire Lodge holiday home located at Lakeland Leisure Park. 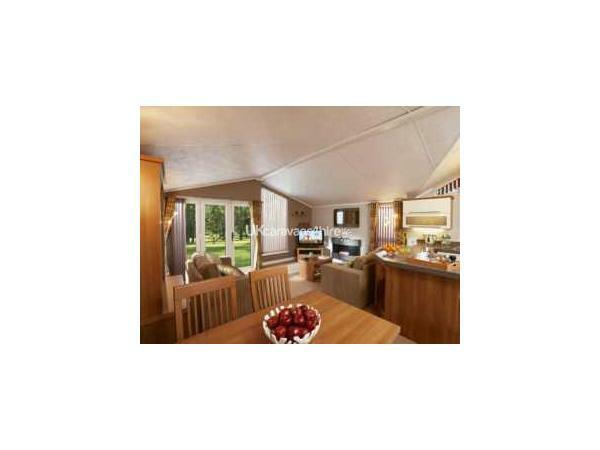 This luxury lodge has all the home comforts you would expect plus a few extras. The lodge is situated in a quiet cul-de-sac on an exclusive area of the park, yet still only a short walk away from the shop, take-away and entertainment complex. The Lodge is spacious (16 feet wide and 40 feet long). 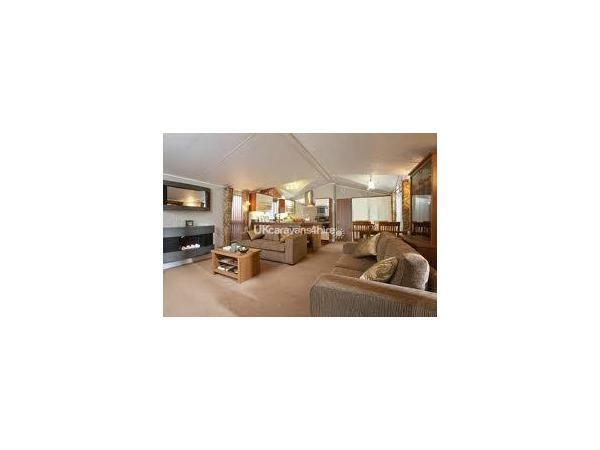 and has a large open plan living/dining/kitchen area and benefits from full gas central heating and double glazing. 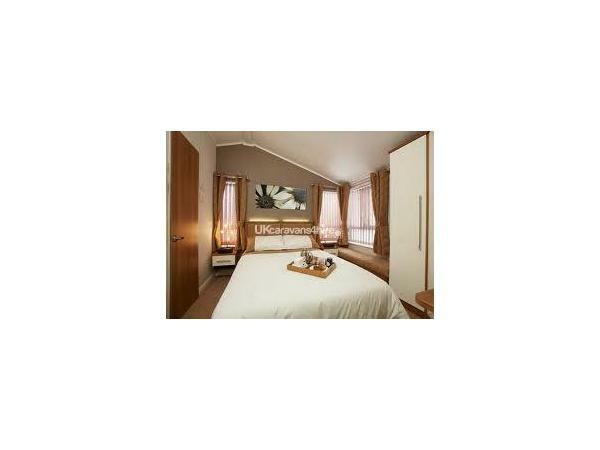 There is one double bedroom with king size bed, TV and luxurious en-suite shower room, and one spacious twin bedroom with walk in wardrobe. A large veranda accessible from the living area through sliding patio doors has patio furniture for your enjoyment where you can enjoy the stunning views across the ornamental lake. 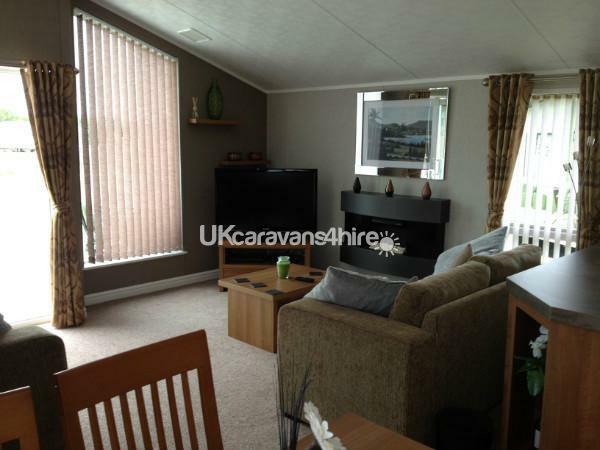 In the living area there are two free standing sofas plus coffee table and a dining table. We have a 42” inch screen LCD TV with Freeview channels and DVD player, there is also a satellite dish with connection for a Sky TV box (if brought from home) and an Ipod dock/radio. We have an XBOX 360 for entertainment on the occasional rainy days - we have a few games but please bring your own. For your convenience there is a bookcase with books and DVD’s for you to use during your stay at our lodge. 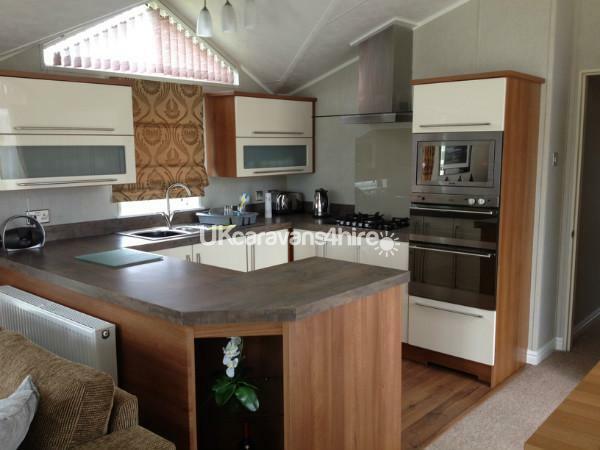 The kitchen area is fully fitted and has all modern appliances (Integrated Fridge Freezer, gas hob, oven, microwave, grill, slow cooker, toaster, kettle) There is also an iron and ironing board, hairdryer for your added comfort. 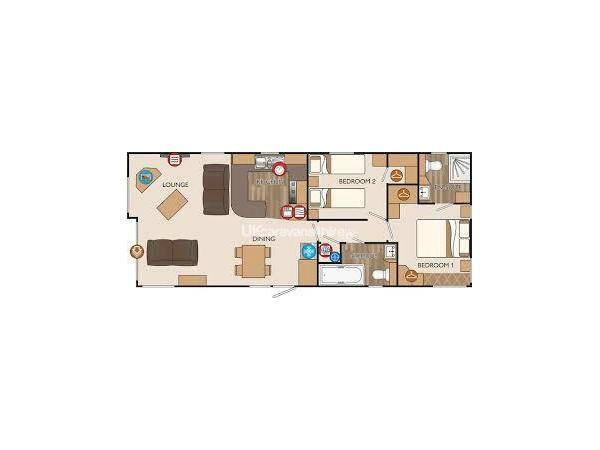 The master bedroom has plentiful storage space, a 22” TV and the en-suite has a spacious walk in shower. 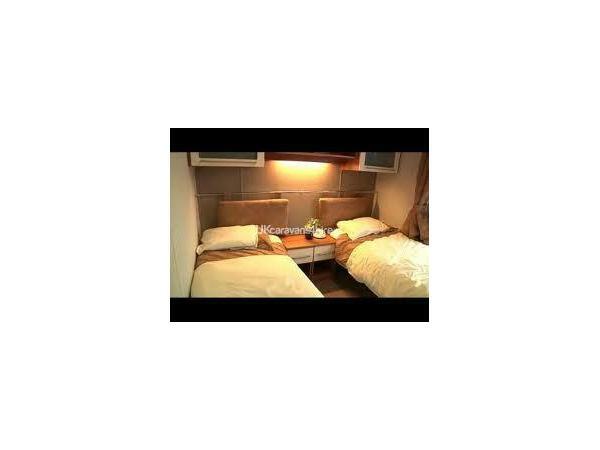 The second bedroom has 2 single beds plus a large walk-in wardrobe /storage area. 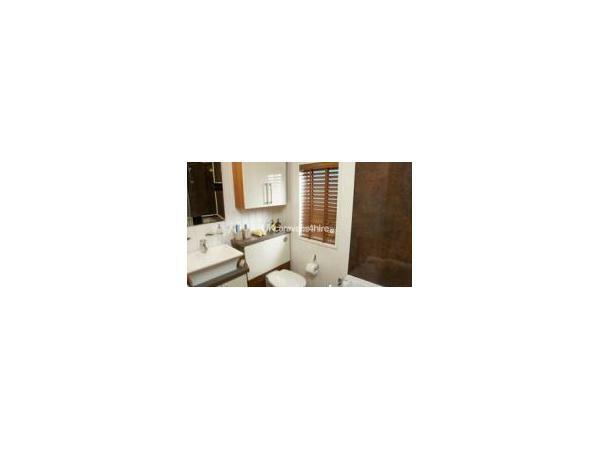 There is a luxury family bathroom with a WC and full size bath with shower over. Included in the rental price is Gas and Electricity, all bedding (beds are made up with fresh linen for your arrival) As with any self-catering holiday you will need to bring with you towels, tea towels provisions/food.Lakeland Leisure Park Entertainment Centre Passes for the site complex can be purchased from the reception on arrival if required. On site at Lakeland Leisure Park for the enjoyment of our guests is a golf course ideal for golf lovers and also the pitch and putt for those less experienced. We regret that no pets are allowed in the lodge and it is no smoking. Upon booking of the Lodge we ask for a £75 security deposit which is returned to you on completion of your holiday, provided that the Lodge has been left in a clean and tidy condition at the end of your stay. 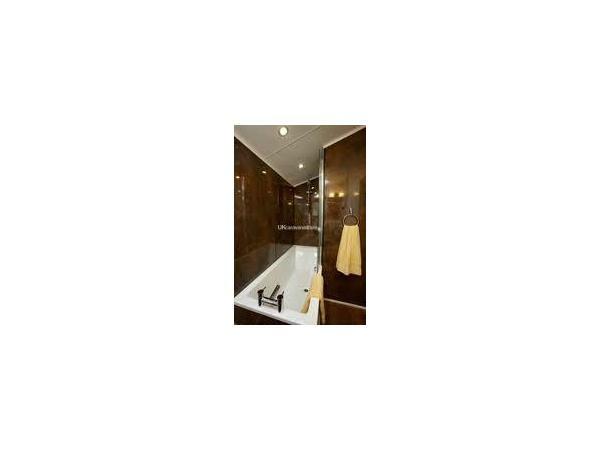 The Lodge is professionally cleaned thoroughly between lettings. Site Amenities Requiring Membership: On-Site Pub/Club, Amusement Arcade, Bowling Green, Tennis Court, Putting Green, Pitch and Putt, Golf Course, Crazy Golf, Indoor Pool, Restaurant, Kids Club. Site Amenities NOT Requiring Membership: Takeaway, Grocery Shop, Laundrette, Sports Field, Boating Lake. Local Amenities: Scenic Walks, Watersports, Nature Reserve, Golf Course, Pubs and Clubs, Takeaway, Fishing, Historical Attractions.